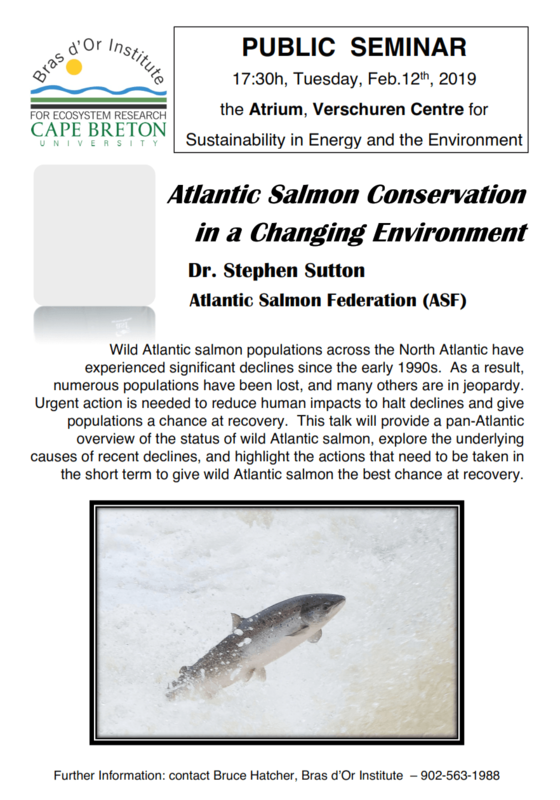 On February 12th at CBU, Join Dr. Stephen Sutton of the Atlantic Salmon Federation to learn about wild Atlantic salmon. Populations of this species have experienced significant declines across the North Atlantic since the early 1990s. As a result, numerous populations have been lost, and many others are in jeopardy. Urgent action is needed to reduce human impacts to halt declines and give chance at recovery. This talk will provide a pan-Atlantic overview of the status of wild Atlantic salmon, explore the underlying causes of recent declines, and highlight the actions that need to be taken in the short term to give wild Atlantic salmon the best chance at recovery. See poster for details.